If you have uneven floors over your crawl space or sagging floor joists, crawl space support jacks may be the solution for your home. Ayers Basement Systems uses the SmartJack® crawl space support system, which provides solid support for sagging and undersized beams, restoring stability and straightness to sagging floor joists in a crawl space. Our crawl space repair system will ensure that your home has a stable crawl space that won't sink or sag. If you're interested in crawl space support jacks in your home, call us today for at 1-844-262-2971 or click below to get started! We offer free estimates on our crawl space repair services in Grand Rapids, Lansing, Kalamazoo and nearby areas in Michigan & Indiana. To be stable, strong, and level, the floor above a crawl space requires solid mid-span support that's usually provided by a post-and-beam assembly. Unfortunately, beams are often undersized, and many contractors use wooden posts that can rot, shift and settle. When this happens, floor joists sag and other structural problems occur. The SmartJack® system is a foundation repair product that provides a permanent solution to these problems. The SmartJack® is installed by attached steel support beams to your floor joists and a sturdy base at the floor. Once all posts are installed, they are adjusted to raise your floors to a level position. The SmartJack® system can be easily adjusted at any point if your home requires it, ensuring that you have a permanent solution to your problems. The SmartJack® is also compatible with crawl space encapsulation systems, making it a good choice for homeowners wishing to eliminate moisture problems and improve home energy efficiency, while also solving structural problems. If your crawl space is sinking or sagging, Ayers Basement Systems is here to help. We eliminate your sagging and uneven floors at the source, giving you a durable solution that restores your home's stability. If you want to put an end to your crawl space repair problems, give us a call today at 1-844-262-2971 or contact us online to get a free estimate on crawl space support jack installation. 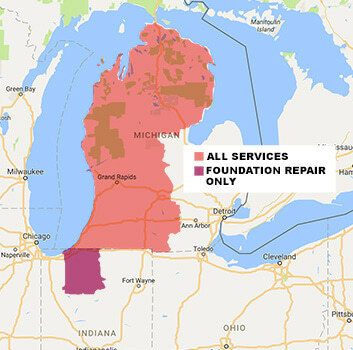 We provide all our services in Kalamazoo, Lansing, Grand Rapids, Traverse City, Muskegon, Battle Creek, Mount Pleasant, Jackson, Niles, Alpena, Traverse City and throughout the surrounding areas.